Melissa Mencini received her BFA from Bowling Green State University in 2000 and her MFA from Southern Illinois University at Carbondale in 2003. Melissa recently moved to Austin, Texas to be a full time studio artist. Previous to her move south, she was living in Anchorage Alaska teaching ceramics at the University of Alaska Anchorage. Before moving to the Alaska she moved back and forth between Montana and Washington State working as a studio artist and teaching at both Eastern Washington University and at the University of Washington in Seattle. During her first stay in Montana, Melissa was a resident at the Archie Bray Foundation for the Ceramic Arts in Helena for two years and was the recipient of the Lincoln Fellowship for one year. Melissa became interested in art at an early age and enrolled in classes at a local art center in her hometown of Cleveland, Ohio. 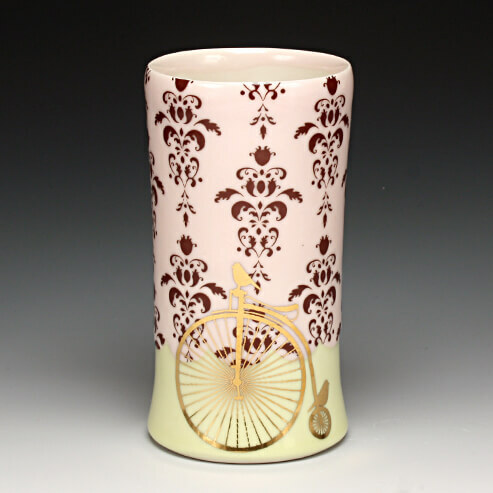 Her current focus is making functional pottery embellished with bright floral designs and decals. She also makes a body of sculptural work dealing with antique medical devices and physical anomalies. Melissa has exhibited her work nationally and internationally. I am interested in the subtlety within form, obvious function and the intimate moment of a pot being used. I prefer to make smaller objects that one would tend to hold close, increasing the users understanding and furthering the investigation of the form. The exploration of these concepts keeps me pushing the definition of my work. Surface also plays a very important role for me. I like to play with images within popular culture to push the idea away from the familiar form to challenge the users expectations of visual and literal interaction of objects. I like for the surface to come alive through use and to watch as those discoveries are made. It all becomes very playful communication: almost a game of flirting between the form, surface and the user.